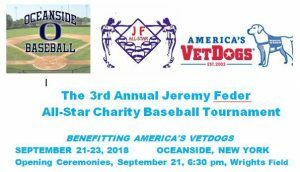 In less than three weeks the 3rd Annual Jeremy Feder Baseball Tournament will be taking place. The tournament provides an opportunity to be out doing some good for others and helping our nation’s veterans and first responders. Please come on down to the opening night of the charity tournament, Friday, Sept. 21, at 6:30 pm, Wrights Field, 264 Mott St., Oceanside. All proceeds from the raffle baskets, as well as sales from Doughology’s amazing donuts, tee-shirt sales, and private donations, will go to America’s VetDogs. This organization provides free, trained service dogs for disabled veterans and first responders. No donation is too small. Everyone is welcome!!! Student volunteers will earn community service credits; volunteers should arrive at 5 pm. Come to meet some of these veterans and their life-saving dogs, and cheer on the kids who will be playing baseball for a great cause. Bring your friends, neighbors, and everyone you know to this community event. We’ll see you there and thank you!